Add a touch of whimsy to your holiday tree this season with Fancy HippoMiss, our glass hippopotamus ornament from the December Diamonds collection. 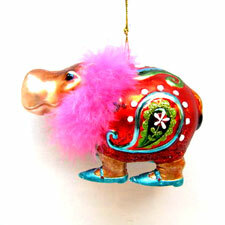 This sparkly hippo wears a fuzzy pink scarf with blue slippers and is beautifully painted swirling flowered paisley in red, blue, and green. She comes ready to hang with a gold cord and is guaranteed to bring a fond smile to anyone's face!